ELECTIOUS REYNOLDS, b. May 1653 and died on19 June 1738 in Middleboro, Plymouth Co., MA age 85 (1). He married MARY PEASE 16 July1686 in Salem, Essex Co., MA. (4/4:249) She was born 15 Dec 1666 in Salem (4/2:149), the daughter of ROBERT PEASE and SARAH (_____) of Great Baddow, Essex Co., Eng. and Salem Essex Co., MA. Robert and Sarah were both charged with Witchcraft during the Salem Trials of 1692. The parents of Electious Reynolds aren't known, nor is it known whether he was born in this country or England. Electious has been shown to have resided in Salem, Essex Co., MA prior to his arrival in Middleboro. He is found in the Essex County records in three lists of county rate, i.e. tax, payers as Electious Ranalls [3/V3p380]; Alextius Renholds [3/V3p386]; and Allextius Rennolds [3/Vep389]. He also testified as Eleckieas Ronalls in a case against Thomas Maule sworn April 18, 1682 in which he was called "about twenty-five years." [3/V3p341] On March 24, 1682/83 he gave testimony as Alexius Reinolds, age 25. [3/V9p55] He married in Salem as "Allexander Renalds" to Mary Pease on July 16, 1686,(4:4/249) the daughter of Robert and Sarah Pease of Salem . He might possibly have been the "Eleksha Renals" and wife Mary who had a son James, in nearby Manchester, MA. on 15 Jan1687 (5/107). There was an "Ellexander Reynolds" on a 1734 list of grantees of Narragansett Township No. 4,. This later became Greenwich, MA., a town that no longer exists, having been flooded as part of the Quabbin Reservoir project. His residence at that time was given as Middleboro. The grant was for services during King Philip's War. (8/429) A search of the Middleboro records did not yield a single Ellexander or Alexander Reynolds so it is probable that this was actually Electious Reynolds. Additionally in his book, Bodge admitted to having difficulty reading the document. We also know that when Electious and Mary's marriage was entered in the Salem records Electious was listed as "Allexander". His name in fact seemed to give no end of trouble to the various clerks and officials who were tasked with spelling it. 1. (Possibly) James Reynolds, b. January 15, 1687 in Manchester. 2. Benjamin Reynolds, b. August 4, 1693 in Middleboro (9/4), m. Sarah SMITH March 10, 1737 in Middleboro (9/62). 3. Mary Reynolds, b. September 12, 1699 in Middleboro (9/4), m. Ambrose BRALEY June 18, 1728 in Middleboro (9/31). Hannah WESCOTT, b. April 7, 1725, m. Aaron SEEKINS April 17, 1746 in Middleboro. He was b. abt. 1725, d. December 15, 1777. Mary WESCOTT, b. November 1, 1726, m. Alexander PEGLEY of Dighton May 22, 1747 in Middleboro. Sarah WESCOTT, b. August 7, 1729, m. William SPRAGUE January 5, 1753 in Middleboro. Joseph WESCOTT, b. April 15, 1732, m. Judah BOOTH July 11, 1757 in Middleboro. Margaret WESCOTT, b. February 7, 1733/34, m. Josiah HASKELL August 16, 1753. He was b. January 17, 1730/31 in Middleboro. Benjamin WESCOTT, b. April 25, 1736. Thomas WESCOTT, b. April 2, 1738, m. Elizabeth BRALEY October 28, 1757. The daughter of Ambrose Braley and Mary Reynolds. She was b. September 30, 1740 in Middleboro. Phebe WESCOTT, b. October 16, 1740, m. Ambrose BRALEY July 17, 1755 in Freetown, MA. He was b. September 30, 1732, prob. the son of Ambrose BRALEY and Mary Reynolds (above). 6. Electious Reynolds Jr. , b. February 21, 1706/07 in Middleboro (9/8), m. Charity CASWELL 1 April1731 in Middleboro (9/47). EPHRAIM REYNOLDS was born February 14, 1704/05 in Middleboro, Plymouth Co. MA (9/8) and died before May 12, 1775. He married ALICE (ELSE) BRALEY on August 16, 1739 in Middleboro. (9/63) She was born July 29, 1722 in Middleboro, the daughter of ROGER BRALEY JR and HANNAH BOOTH of Plymouth Co., MA. 1. Joel Reynolds, b. 20 Oct 1741 Middleborough, Plymouth Co., MA and died Bef 1823 in Warsaw, Wyoming Co., NY. He married Elizabeth Douglas on 17 Mar 1776 in Middleborough, Plymouth Co., MA. 3. Roger Reynolds, b. abt. Abt 1744 Middleborough, Plymouth Co., MA. and died between 1810 to 1820. He married Sarah Braley on 07 Apr 1777. She was born in 1770, the daughter of Samuel Braley and Sarah Taylor of Middleborough, MA and Belgrade, Kennebec Co., ME. Samuel was the son of Ambrose Braley and Mary Reynolds and the grandson of Electious Reynolds and Mary Pease. DANIEL REYNOLDS was born May 13, 1754 in Middleboro, Plymouth Co., MA and died May 13, 1832 in Burnham, Waldo Co., ME. He married THANKFUL HASKELL April 28, 1784 in Grafton, Grafton Co., NH. She was born in 1766 in Middleboro or Freetown, MA, and died in 1855 in Burnham, the daughter of ZURIEL HASKELL and THANKFUL WESCOAT. 2. Thankful Reynolds, m. Dec. 1811 John Wadley. 7. Barach (Barak) Reynolds, b. March 1796, Grafton, N.H., m. 14 Jan 1815 in Burnham to Clarissa (_____) Reynolds. he d. 1857 Burnham. 9. Lorana Reynolds, b. 1805 Burnham, ME and died on 01 Jan 1889. She m. Isaac Childs on 21 Mar 1821 in Burnham, Me. JOHN B. REYNOLDS was born September 12, 1797 at 25-Mile Pond (Burnham), Waldo Co., ME, and died September 12, 1869 in Burnham (10). He married BETSEY DODGE. She was born September 11, 1804 and died June 11, 1890 in Burnham (10), the daughter of CALEB DODGE and SARAH MESERVE. "A few months since a resolve was presented in the legislature of Maine, in favor of granting a pension to Mrs. Betsey Reynolds, Widow of John Reynolds of Burnham, and the following facts were stated in support of the resolve; "viz., that she "sent four sons, two sons-in-law-, and one grandson to the war, neither [none] of whom returned to tell their story. They all died defending our flag. When the war closed she was left with thirty-one orphaned grandchildren, made so by the war. Her only surviving son, who is lame, volunteered but was rejected on account of his lameness. Mrs. Reynolds is now depending on her own labor for her livelihood. Seven of her orphan grandchildren were taken into the Bath asylum" . 5. Christina Reynolds, b. abt. 1842 (11), bur. in Mount Cemetery, Burnham. 8. Drucilla Reynolds, b. 1846/47, d. May 28, 1933 at 86, m. Henry HUFF. He was b. in 1845, d. October 5, 1899, son of Horatio HUFF and Mehitable REYNOLDS. This could be the same person as Isaella, above. GILMAN H. REYNOLDS was born about 1826-1828 , and died 10 Mar.1865 in the Union army hospital at City Point, Virginia. He married BETSEY E. HUFF October 3, 1850 in Burnham by James H. Haines, JP. She was born in 1829 and died December 3, 1866. She was the daughter of HORATIO HUFF and MEHITABLE REYNOLDS of Burnham. Gilman was a private in Company A, 20th Regiment of the Maine Volunteers. He enlisted for a period of one year on 20 Sep 1864 at Belfast, Waldo Co., ME. His death from "camp fever" ie. typhoid occurred less than six months later. His widow Betsey applied for a pension based upon his Military service. Copies of the documents in her pension file reveal that in November of 1865 the court felt it necessary to appoint Albert F. Watson of Unity, Waldo Co., Maine as guardian of her children. While nothing in the documents within the pension file reveal the reason or reasons why this was considered necessary it was presumably for reasons of ill health since Betsey died less than a month later. To attest to the pension office that Betsey was indeed, deceased, a number of sworn statements were sent to that office. A sworn statement was even included from the woman who made the grave clothes for Betsey. 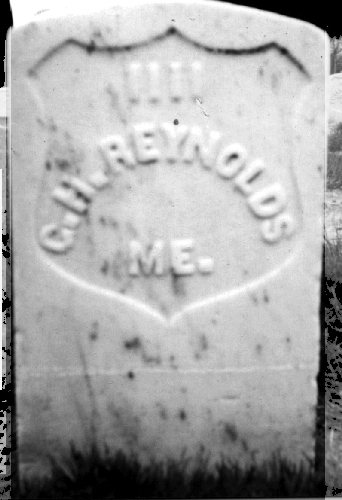 DELPHINA REYNOLDS, born September 1, 1851, in Burnham, Waldo Co., ME, [12/1:249] and died December 29, 1938 in Rumford, Oxford Co., ME. She married ELI ADAMS TWITCHELL on May 11, 1872 in Hallowell, Kennebec Co., ME [12/5:32], the son of GERSHOM TWITCHELL and NANCY S. SPRING of Burnham. Melissa E. Reynolds, 13 Dec 1852, Burnham, Waldo Co., ME. Melvin Reynolds, b. 1 May 1855, Burnham, Waldo Co., ME. Amassa Alonzo Reynolds, b. 22 Oct. 1856, Burnham, Waldo Co., ME. Arthur Gilman Reynolds, b. 22 Apr 1859, Burnham, Waldo Co., ME., d. August 6, 1876. Augusta Reynolds, b. 31 Dec. 1860 Burnham, Waldo Co., ME., m. (2nd) Benjamin A. Goodwin August 18, 1880. Christopher Reynolds, b. 15 May 1863, Burnham, Waldo Co., ME. Record of Deaths - Middleboro, MA. 1947. p. 143. The History of the Town of Middleboro. Thomas Weston. 1906. Records and Files of the Quarterly Courts of Essex County Massachusetts. 1975. Vital Records of Salem, MA to the End of the Year 1849. 1903. Vital Records of Manchester, MA to the End of the Year 1849. 1903. The Reynolds Family Association - 30th Annual Report. 1921. p. 75. George Madison Bodge, "Soldiers in King Philip's War. ", 1906. Lambert Merrick and Alicia Crane Williams. 1986. Gravestone Records, Mount Cemetery, Burnham, Waldo Co., Maine. 1850 US Census, Burnham, Waldo, Maine. p. 243. Vital Records of Hallowell, ME. V. 1. R Crosby, "Waldo Co., Marriages, V. 2, p. 283"
Maine State Library - Huff Safe, "Decendents of Thomas Huff and Mary Bridges". Communication from Adjutant General's office dated 30 Nov 1865 regarding application for Pension, file #104,273 by Betsey Huff Reynolds. Sworn statement of 25 July 1865 by Burnham town Clerk William Berry, concerning records of marriage for Gilman Reynolds and Betsey E. Huff in his custody. Document in pension records of Betsey E. Huff. Sworn Statement of Albert F. Watson, guardian for the minor children of Gilman and Betsey Reynolds, deceased. Dated 12 Jan 1867; "that the mother of the children aforesaid [Betsey] died at Burnham, Waldo Co., Maine on the 3rd day of December 1866, in the night preceeding the 4th day of December 1866"
Sworn Statement of 7 January 1867 by Burnham town Clerk William Berry, concerning records of marriage for Gilman Reynolds and Betsey E. Huff and records of the births of their children, all in his custody. Document in pension records of Betsey E. Huff.. Has marriage date and birth dates. Certificate of guardianship for A. F. Watson from B. P. Field, register for the Court of Probate, Waldo Co., ME., dated 27 Dec 1866. Affirming that at a Court of Probate held at Belfast, Waldo Co., ME on the second Tuesday of Nov, 1865 the said A. F. Watson was "duly appointed and confirmed guardian" and then a list of the children of Gilman and Betsey Reynolds. New England Historical and Genealogical Register, Oct, 1870.